Kornelis adds to its certification bank this year the FSSC 22000 (ISO 22000 + PAS223) certificate for Food Safety Management Systems. "This takes our company once again to a higher level. 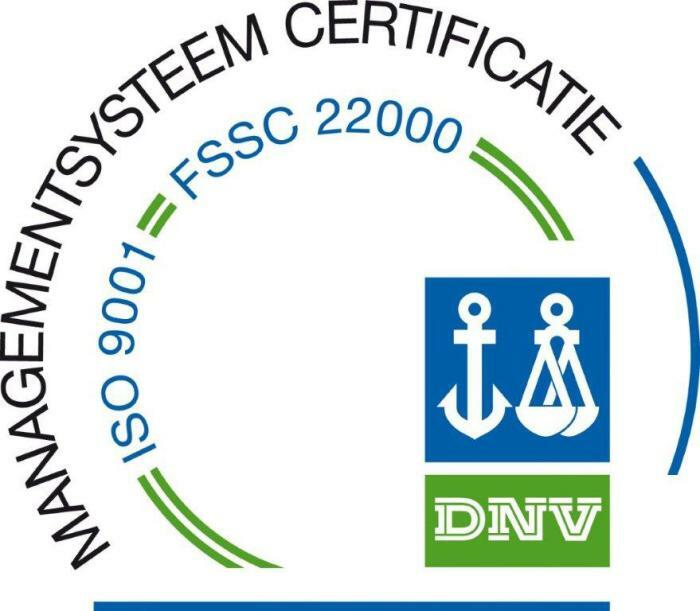 We are very pleased to have received this certificate in addition to ISO9001, which Kornelis has had since 1996," says Commercial Manager Dave Busstra. The Foundation for Food Safety Certification was founded in 2004. The Foundation developed FSSC 22000, the ISO 22000 and PAS 220 based certification scheme for certification of food manufacturers. This development is supported by FoodDrinkEurope. The scheme is recognised by the Global Food Safety Initiative (GFSI). This PAS is intended to be used in conjunction with BS EN ISO 22000, not in isolation. For the purpose of this PAS, the term food includes beverages. This certification is an ISO based, internationally accepted certificate for audit and certification of food safety throughout the whole supply chain. All audits are conducted by DNV and concluded with good results.